Softcover. Intro' by Edna Buchanan. Read the personal accounts of America's most daring and distinguished crime reporters as they recall the stories that moved them, disturbed them, and drove them. The stories that through their sheer brutality and heartbreaking inhumanity captured imaginations across the country : Ronald Gene Simmons, who invited 14 of his relatives over to celebrate the Christmas of 1987 and murdered them all in cold blood. Roy Allen Stuart, the man accused of 10 rapes and 4 sexually-motivated murders in East Texas. Colin Ferguson, the man who, on December 7, 1993, boarded the 5.33 train on the Long Island Railroad and opened fire with a 9mm Ruger killing 6. Experience these unforgettable stories told by the reporters who lived them, made them breathe. 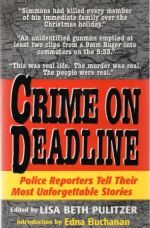 Their powerful, hard-edged prose will pull you into the real world of police reporting: the scene of the crime, the adrenaline highs, the brick-wall lows, the race for that key source, and the long, caffeinated nights at the keyboard putting it all together. It is the quest for the scoop. It is the quest for the truth. 274pp. trade size softcover. From the library of true crime writer, Wilfred Gregg, with his personal b/plate. V.v. lightly browned pp. o/w Nr. F. with no creasing to covers.